Periodontal disease, or gum disease, is the primary cause of tooth loss in America. People over 35 years old face a 75% chance of having the disease. Many times, early symptoms go undetected. If you experience bad breath or bleeding, red, swollen, or slightly tender gums, visit our office immediately for a hygiene appointment. Our hygienist will assess your soft tissues for gum disease and provide you with professional solutions to combat the condition. Gum disease begins when the bacteria produced by plaque grow and flourish at the gum line. These bacteria make the gums pull away from teeth, and they hide and breed in the “pockets” they create. Left untreated, gum disease will cause gum recession and bone deterioration. Studies show a connection between gum disease and heart attack, stroke, osteoporosis, and respiratory problems. To restore your oral health, our hygienist will deeply clean your gums with procedures known as scaling and root planning. Scaling removes plaque and hardened plaque called tartar, from teeth. Root planning smoothes the root surfaces of teeth, making it harder for plaque to form. With the Micro 980 soft tissue laser, Dr. Gunnin will remove the bacterial buildup in periodontal pockets so that gums will reattach to teeth. In some cases, diseased gum tissue is removed, so that healthy tissue will naturally grow in its place. 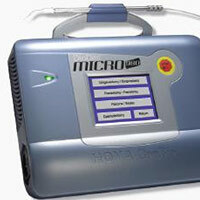 Laser gum therapy is a gentle procedure with no cutting or stitches, so recovery time is brief. After a person has gum disease, he or she is more likely to get it again. Dr. Gunnin and our hygiene team will work with you on a plan to maintain your healthy gums. This may involve more frequent cleanings and habit changes (stop smoking). Your gums are the foundation of your smile. Before performing restorative or cosmetic dentistry procedures, it is essential that we eliminate gum disease and restore your mouth to optimal oral health. Each year, the innovations in dentistry techniques and technologies are astounding. Treatments are becoming more comfortable for patients, more efficient for dentists, and the result is a more natural looking, beautiful smile. At Rogersville Family Dentistry, we’re dedicated to remaining at the forefront of dental technology in order to offer our patients the highest quality care. One of the many advanced dental technologies we incorporate into our practice on a daily basis is the Waterlase soft and hard tissue laser. 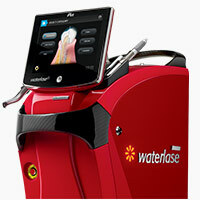 Waterlase combines traditional laser energy (concentrated light waves) with water to make a number of dentistry procedures faster, more precise, and more comfortable. In most cases, patients don’t even need local anesthesia when we perform treatments with Waterlase. Waterlase allows us to perform this array of treatments without the vibration, noise, heat, or discomfort associated with traditional dental drills.